Help us continue our artist support programmes, and the work we do in our community. Every £1 donated to Jacksons Lane is curently being matched £ for £ by Arts Council England! Have a browse through our upcoming shows, including the best in circus, comedy, theatre and shows for families. Find out more about the work we do every Christmas Day for older and disabled people who would otherwise spend Christmas alone. Jacksons Lane was founded by determined activists within the community in 1975. Prior to its current use as a thriving arts centre, our building was known as the Highgate Wesleyan Methodist church, and it first opened in 1905. The building was designed in an early Gothic style, included a Sunday school, and was designed by W. H. Boney of Highgate. The church itself seated 650 and the schoolroom next door seated 400 people. The church became particularly well known during the 1960s for its community work. The church was closed in the early 1970s and for a while remained unoccupied. During this period of the early 1970s, a group of local residents, parents and campaigners believed the now unused building should become a place for the community to come together, where young people could find a voice, and where creativity could be celebrated. This core group of passionate activists campaigned for several years to be able to use the building. They were successful, and secured a lease for the building from Haringey Council alongside a small grant to develop the building - supported by then Haringey Councillor Jeremy Corbyn. Jacksons Lane pulses with community spirit but at the same time opens its doors to the world. An amazing space. 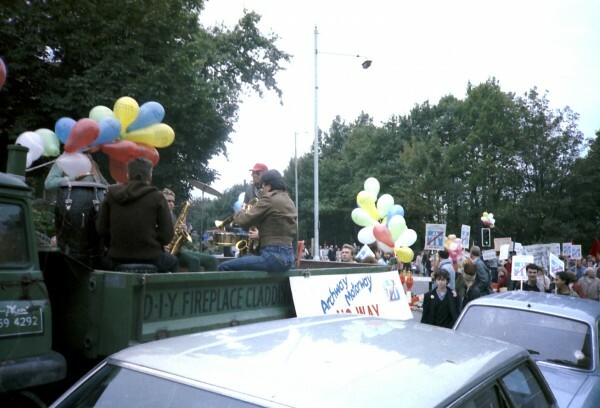 In 1975 Jacksons Lane was reopened to the public and began its life as a social and cultural hub for North London. Key founders of Jacksons Lane include Nicky Gavron (London Assembly Member, and previously Deputy Mayor of London), Melian Mansfield (current Chair of the Board), and Paul and Jan Brooker (who - for over 40 years - still lead on the annual provision of lunch, gifts and entertainment on Christmas Day for older and disabled people who would otherwise spend Christmas on their own). For the first few years, Jacksons Lane was managed and run entirely through a committed team of volunteers determined to create somewhere special for people to enjoy. At this time, there were plans to widen the Archway Road, and so to knock down the buildings that line it, including Jacksons Lane. 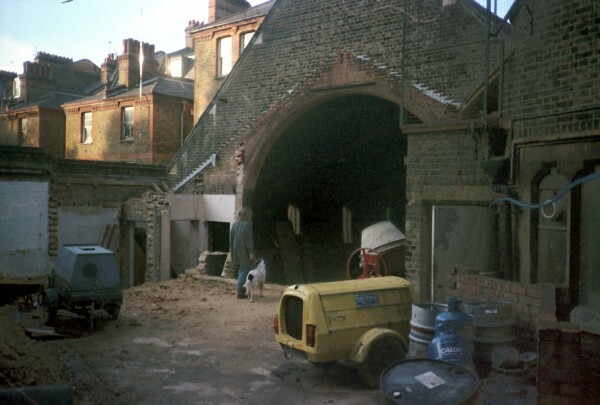 The campaign to save the Archway Road - and Jacksons Lane - from the bulldozer continued with this building at the heart of the activity. The campaign was ultimately successful, Jacksons Lane received a Grade II listing and Archway Road was made a preservation area. With its continued physical existence now preserved, Jacksons Lane launched a large-scale fundraising campaign to make improvements to the building, and to install a fully equipped, raked theatre into what was the church hall and schoolroom. Working with architects Tim Ronalds, the new theatre space opened in the 1980s and provided fantastic facilities and more opportunities for artists. The technical areas were made fully accessible, and a programme of technical theatre training for people in wheelchairs was established. This capital project gave Jacksons Lane six spaces for the creation of work, including its 166 seat auditorium, and won a RIBA Community Enterprise award. Jacksons Lane has always been supportive of young and emerging artists and over the years Jacksons Lane has supported hundreds of companies at the start of their careers. Now-established names and companies, such as Complicite, The Mighty Boosh, Out of Joint and Frantic Assembly all developed work at Jacksons Lane. Eddie Izzard began his comedy career supported by Jacksons Lane, and we were also the site where Matt Lucas and David Walliams first performed together. Jacksons Lane's work is felt across all forms: circus was part of the programme right from those earliest days, as well as comedy, drama, music, dance, and Xposure - the UK's first disability arts festival. 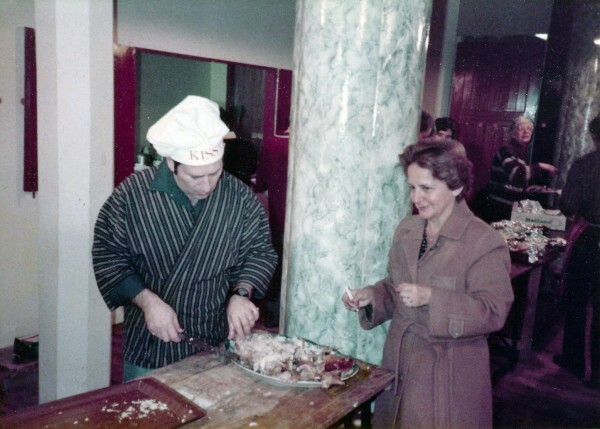 World-renowned playwright, Arnold Wesker, carves a turkey for older people who would be otherwise alone on Christmas Day. Today we are recognised as the UK's leading producer of contemporary circus, the leading arts venue for Haringey and a National Portfolio client of Arts Council England. We have a full-time equivalent staff team of 26 people, serve over 200,000 people a year and have a turnover of £1.3 million. But we always remember that everything we do stems from the determination, passion, and activism of a committed group of volunteers.